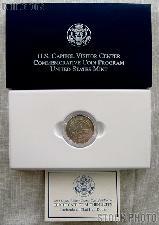 We are pleased to offer for sale this 2001-P Capitol Visitor Center Commemorative Uncirculated Half Dollar. This Capitol Visitor Center Commemorative Clad Half Dollar was minted in 2001 and is in Brilliant Uncirculated condition. This Capitol Visitor Center Half Dollar was struck to commemorate the first convening of Congress in the Capitol building. There were 99,157 of this 2001-P Capitol Visitor Center Commemorative Uncirculated Half Dollar minted at the Philadelphia (P) mint. This Capitol Visitor Centern Half Dollar is comprised of 92% copper and 8% nickel with a diameter of 30.61mm and a weight of 11.34 grams. The obverse of the Visitor Center Half Dollar was designed by Dean McMullen and features a circle of 50 stars enclosing the current Capitol dome profile with the 1800 portion detailed. A horse and carriage is shown in the foreground. The reverse of the coin is a composite of designs by Alex Shagin and Marcel Jovine. The reverse shows a circle of 16 stars around the center with the inscriptions "1800, 6th Congress, 32 Senators" and "House 106 members." 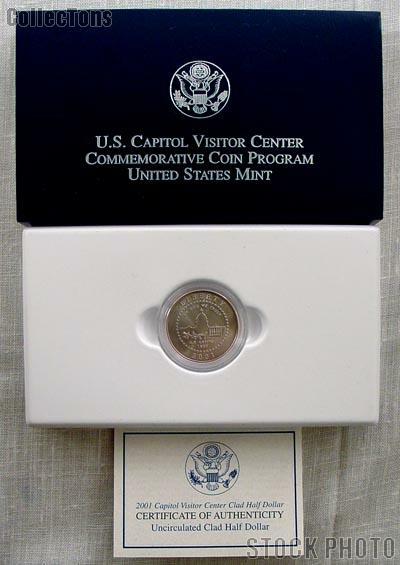 This 2001-P Capitol Visitor Center Commemorative Half Dollar is encapsulated and comes in the original U.S. Mint packaging with a Certificate of Authenticity (COA). 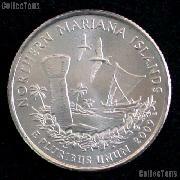 This coin is of great worth and value to the collector who is trying to fill out their Commemorative Coins Collection! This coin is a great value for the price! Don't miss out on this rare 2001-P Capitol Visitor Center Commemorative Uncirculated Half Dollar!